The iPad sensation is truly wild. I have one (of course) and use it often to present mathematical ideas and problems, stories with a mathy context and visual manipulatives to my students while I teach in classrooms around the province and territory. What I struggle with is the never-ending search for quality math games for the iPad that amount to more than digital drill… :oP Surely the technology can offer up something more thought-full?? I found an app this week that is worth sharing, called Pick-A-Path. It was released by the NCTM (National Council of Teachers of Mathematics) and features a number-puzzle for students to solve. 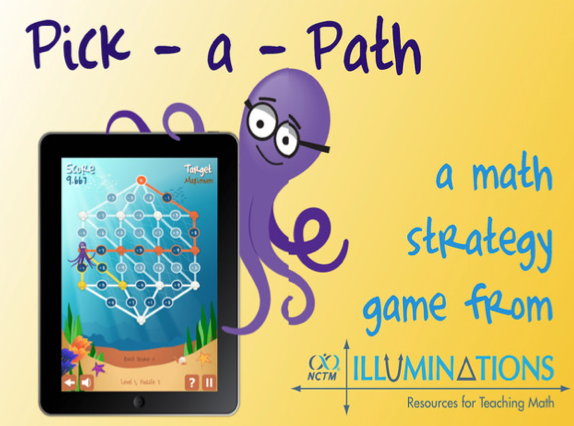 The goal of the game is to navigate a maze, moving an octopus (Okta) through a series of numbers and operations, trying to create a maximum or exact amount. In the different levels, students use whole numbers, powers of ten, integers, fractions, exponents and decimals to solve the puzzles, gaining “starfish” as prizes. It had me hooked! Because for the different levels, I can see it being used from grades 2/3 through grade 9 — if you want to stick to the curriculum precisely — and beyond that, if you’re looking for a challenging game. Oh – and it’s free!